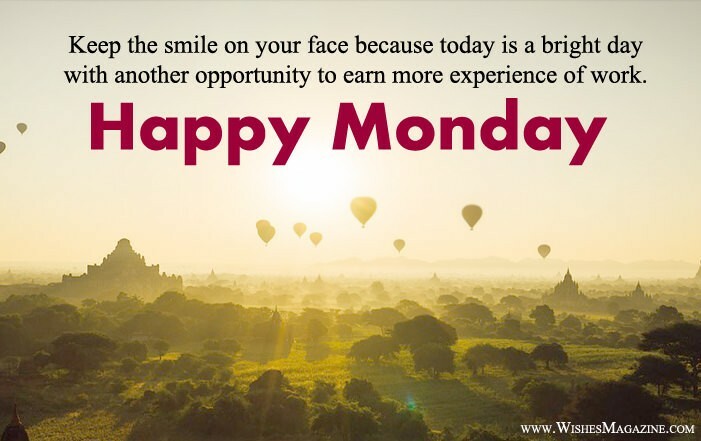 In this section we are sharing a collection of Happy Monday morning wishes and Happy Monday messages, you can send these wishes messages to your family, friends, love one, relatives, colleagues etc. In life There is no space for regret So love people, start your day with positive energy the ones who treat you right and forget about the ones that don’t. Waking up to a new day is a gift to try for better future, honest with your work and trust in your self, Have the best and blessed Monday. I wish you a blessed day and put the smile on your face. May no problems will come on your way On this bright Monday morning That starts a new week. Monday is the fresh day and the beginning of the week, Just like hard work is the foundation for success, Wish you a great working day for a whole week. Good morning have a great Monday. I wish you glorious Monday full of prosperous achievements. There are lots of things to be done today, So make the list and don’t get away, Good morning, Have a Nice Monday. May you have a blessed Monday with wisdom, patience and the best security of faith. Wish you a great week ahead. My wishes for a wonderful and blissful Monday, may your day starts with new possibilities and responsibilities. May your day is full of motivation and inspiration of work. Wish you a great start to a week. Have a Happy Monday. My wishes for you have a splendid Monday morning full of happiness with gentleness in your eyes and a heart filled with love. the shine of love and excellence in your life. Monday is a new beginning of better days ahead. Always put smile on your face and get more success. Keep the smile on your face because today is a bright day with another opportunity to earn more experience of work. Monday is a day to planning for a week and chance to fill your heart with endless joy and happiness. Every day has its own uniqueness. Monday is good start and you need to have a great week ahead. Monday is the day for Always be cheerful and find good reasons to love everyone around you.